Bonsai Direct offers the very best bonsai trees for sale with excellent customer service. This Christmas bonsai tree is no exception, We have been growing this bonsai for over 12 years and it has a very pretty shape. As part of our premium range this pretty bonsai is supplied with a matching ceramic drip tray. Care instructions are included with all orders and you can choose your delivery date at the checkout. Delivery is free to most areas (Monday-Friday) but we do deliver 7 days a week. Beautiful quality Christmas gift to delight! We have been growing this pretty Oriental Tea Tree (Carmona microphylla) for 12 years now. 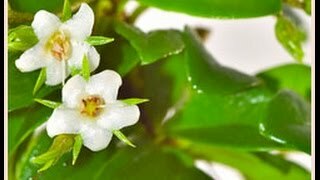 It has a lovely flowing trunk and pretty white flowers during the summer months. A popular indoor bonsai which has a very artistic shape and overall elegance. * Pot details: Festive Christmas red oval ceramic bonsai pot.